One of the main projects at the CBL this year has been the conservation of the Hebrew manuscript collection, which contains an array of items including pamphlet bindings, Torah scrolls, single codex folios, and bound manuscripts. The majority of this collection is on parchment, with a small percentage on paper. 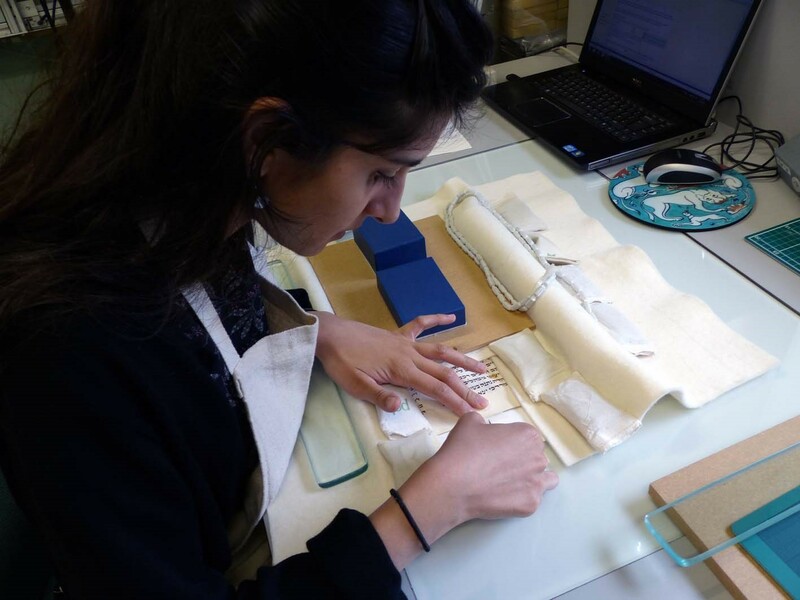 I was allocated a number of items to conserve from the collection, which allowed me develop my knowledge on parchment repair techniques and gain a more informed understanding of this material, which differs from paper immensely. Single codex folio, Heb 753.5 (c.14th-16th century) was previously stored between glass. An interesting part of this collection for me was the conservation of three single folios on parchment, which were previously housed in glass enclosures. The first step was to remove the folios from the enclosures by removing the tape sealing the two sheets of glass together. A scalpel was used to score across the edges of the tape to begin dismounting. Once the folios were removed from the glass treatment began, which involved tape and adhesive removal and repairs to weaknesses and areas of loss using Japanese tissue and isinglass (5% solution applied with a brush). Isinglass is a pure gelatine made from the swim bladder of the sturgeon fish and it was selected as the adhesive due to its strength and its sympathetic nature with another protein-based material. 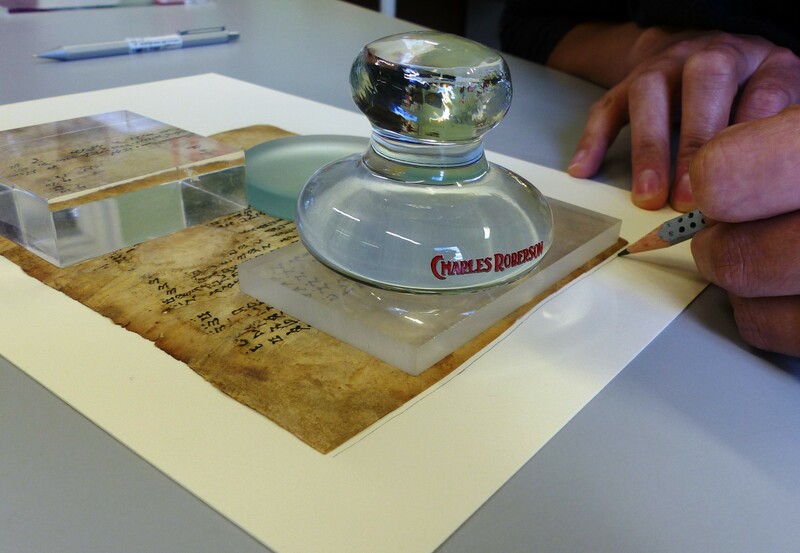 Due to the reactive nature of parchment, it was vital to keep the folio gently weighted during treatments. The final step was to rehouse the folios, which for me was the most challenging yet fascinating part of treating these folios. Tutored by Kristine, I was taught how to mount parchment, whilst keeping specific considerations in mind such as the reactive nature of the material. Marking the inlay aperture by drawing around the folio with a soft pencil. To begin with, the folios were inlaid into a 100% acid-free, cotton card. Inlaying has several purposes; to create a false margin for handling and to help control the movement of the parchment. Parchment tends to bow and cockle due to fluctuations in temperature and relative humidity, which can be problematic during handling; the inlay also removes the need to overmount the folios with a window. The inlay was produced by placing the folio on the card and then carefully drawing around it, approximately 3mm larger than the object. This space will allow for the parchment to expand and contract if need be. The outline was then carefully cut out using a scalpel. Once the inlay card was prepared, paper tabs were made from Sekishu Japanese paper, which were cut to various thicknesses but of the same length (approximately 15mm) to accommodate the uneven nature of the folio. The tabs were adhered to the edges of the folios but distributed unevenly, to avoid creating any points of weakness along any specific side. The tabs were feathered and adhered with isinglass to the parchment. Small tabs of Sekishu paper were adhered to the edges of the folio using isinglass, in preparation for inlaying. Once the tabs were secure on the folio it was time to adhere them to the inlay card, which was achieved by applying wheat starch paste to the other ends of the tabs and applying them to the card. A mount was then created to house the folio in its inlay card. The card was adhered to the left-hand side to allow readers to easily access the verso of the folio. The folio was inlaid into 100% cotton card by adhering the tabs with wheat starch paste. The inlay card with the folio was hinged into a window-mount. Other types of work undertaken on this collection have included the rehousing of a collection of small parchment scrolls and the conservation treatment of a large Sefer Torah scroll on traditional gevil, which is an animal skin processed in a specific way to result in a finished product somewhere between parchment and leather. 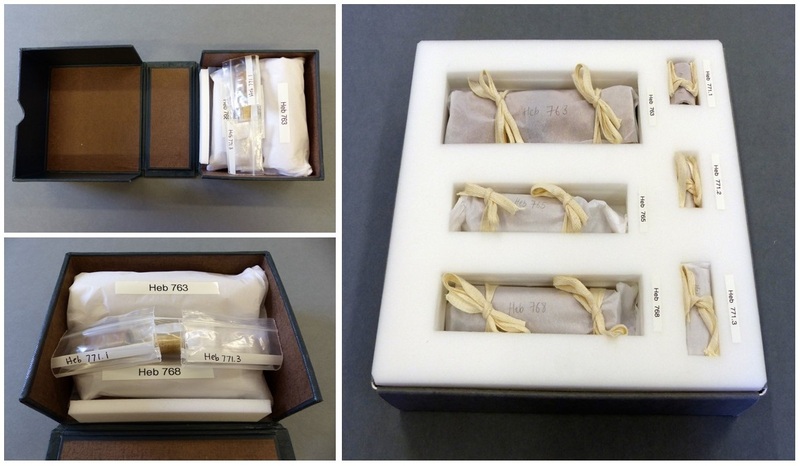 Left: A collection of scrolls were previously housed in an unsuitable box without adequate protection. Right: A new housing system was devised, which included layers of foam cut at different depths to accommodate each scroll and provide suitable storage and protection. Each scroll was wrapped in acid-free tissue and secured with cotton tape. Learning about sewing techniques was another new skill I developed whilst working on this project. This allowed me to see dramatic change in Heb 773, which had many lose and detached skins. Using linen thread, I reinforced the joins between the skins, allowing the scroll to eventually sit comfortably when rolled. Heb 773, Sefar Torah scroll on gevil (c.17th century), before and after conservation treatments. Coming from a flat paper conservation background, this was a challenging object for me to work on due to the large size of the scroll, totalling 45 skins and a length of 2179.5cm (over 21 metres!) and the types of treatments required, such as sewing. However, I feel I have learnt a great deal from working on this object and many other scrolls, which has opened up a new interest and understanding of parchment and inks for me. Having the chance to work on this collection has allowed me to consider the challenges of working with parchment whilst gradually allowing me to make decisions independently on the best choice of treatments for the objects at hand. This will be Puneeta’s last post as she has reached the end of her year-long internship. We would like to wish Puneeta every success with her career in conservation! Wonderful work in loving hands.